exceptional organic & eco-friendly products delivered right to your door, once-a-month. Think of it as a CSA or Wine Club subscription, except instead of veggies or Pinot Noirs you are discovering well-loved products better and safer for you & your family than conventional alternatives. 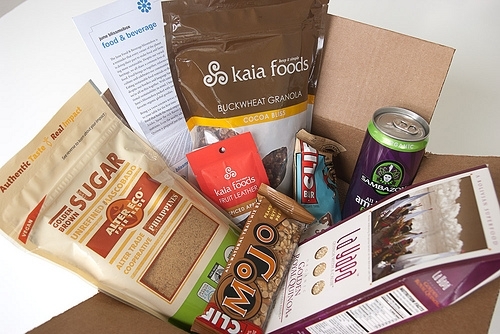 what brands and products are in the box?You’ll have to subscribe to find out, but previous boxes have included exceptional products from well-loved brands including method Laundry, Sambazon, Numi Tea, CLIF Bar, and YesToCarrots. Each box has on average $30 of product value (sometimes much more – our June skin & beauty box valued at $51) — and you’ll get to discover curated products safer & better for you, your family & your planet. More questions? Read our blissmobox FAQ or email us at box (at) blissmo (dot) com. This particular blissmobox is a foodbox and I can’t wait for you to win! The winner will be announced on Monday. To enter simply sign-up for the blissmobox newsletter by clicking here. Come back to this post and leave a comment telling me that you have signed-up for the newsletter. The winner will be selected at random from the comments on this post and announced Monday, July 18th. I signed up for the newsletter! Thanks for having this awesome giveaway! I have signed up for the blissmo newsletter. This looks great. What a great way to try new products. Thanks. I signed up for the newsletter. the blissmo box looks great! i signed up for the blissmobox newsletter! I have signed up for the blissmobox newsletter. I signed up for the blismobox newsletters! This giveaway is great because it’s varied 🙂 thanks! I signed up for the newsletter–thank you so much for offering this giveaway! I signed up to receive the newsletter! Very cool! I am signed up! I just signed up for the news letter! What a great looking box of treats! All signed up, that box looked fab! I signed up! Looks great!